Picturing Disney: Save money for your next trip AND Save Lives with Save1.com! Save money for your next trip AND Save Lives with Save1.com! 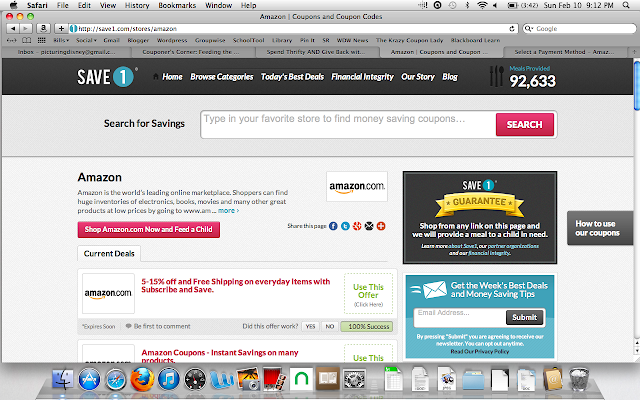 Recently I discovered Save1 a website set up like many others which compiles lists of coupon codes with links which you can directly click to get you to the deals on the websites. These sites are great in many ways because they offer you one place to find all of the best deals the web has to offer (from stores we love like The Disney Store, Target, Walmart, Kohl's, and Amazon to name a few). Another plus is that some offer you incentives for some sort of coupon or cashback. Arguably, however, Save1 has now narrowed the market completely! Why you ask? Well, because you can earn FREE MEALS FOR THE HUNGRY!! As you know, I am a firm believer that no one should die of hunger and have felt the need to give back over and over. I must say that the idea of giving back while shopping without much more than an extra click is so mind-blowing I can't believe these kind of sites have never been established before! It is the perfect, easy, give and get scenario-- you are getting great deals on the things you are buying online and giving a meal to someone in need. You can search the site using the search bar, check out the best daily deals, and even meet the lovely family who has established this site. Once you try it and see that little ticker click forward one more meal provided you will be hooked! (I was so excited to see the meal ticker having moved the day after I placed my order.) Also, there is a promotion going on now where you can help provide meals simply by sharing!! Head here to like & share on Facebook and to sign up for their newsletter! Additionally, if you aren't sold on the site already, check out the donations page to see all the meals that have been provided thanks to shoppers like YOU over the last few months! Now when I paint my nails with the set of Oz inspired polishes from OPI (review and swatches coming soon) I will remember that while I could have gotten my Free Super Saver Shipping at Amazon by going to the site directly or trying another coupon site instead I made the choice of love and sharing and helped provide meals to those in need! I can't imagine an easier way to give back. Save1 compensated me for my review/post.